Home › Home News › Meet Willie, an inspirational volunteer! MMI in Papua New Guinea works in partnership with Callan Vanimo Special Resource Centre and Buk Bilong Pikinini on two projects; Inclusive Communities and Early Childhood Learning. Willie, works as a volunteer in both these projects; he helps the children in the early learning education program once a week and also is most passionate about serving in his own village with the children who are hearing impaired in the inclusive communities program. 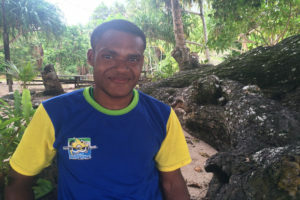 For Papua New Guinea, we hope for a future with inclusive educational institutions, greater employment opportunities and a more inclusive environment for all people with disability. We hope you are able to support us, as you are able, so that we can continue our work with the most vulnerable in our country and expand this life-giving work. We also hope you will find Willie’s story as inspiring as we did.